The Solomon R. Guggenheim Foundation, New York (by 1939). Donald H. Karshan, New York. Gary Snyder Fine Art, New York. Acquired from the above by the present owner, November 1999. Charleston, Gibbes Memorial Art Gallery, The Solomon R. Guggenheim Collection of Non-Objective Paintings, March-April 1938, p. 36, no. 92 (illustrated). New York, The Solomon R. Guggenheim Foundation, Art of Tomorrow, Fifth Catalogue of The Solomon R. Guggenheim Collection of Nonobjective Paintings, 1939, p. 111, no. 180 (illustrated). Rowland Weinstein has confirmed that this work is in the Bauer archives. Bauer, born in 1889 in Lindenwald, Germany, was an avid artist at an early age. In 1905, he studied briefly at the Academy of Fine Arts in Berlin, but without the support of his family was forced to leave. Between 1910 and 1914 he made a living as a magazine illustrator. Bauer was initiated into the Galerie Der Sturm circle around 1915, and was exposed to members of Die Brücke and Der Blaue Reiter, such as Franz Marc, Paul Klee and Wassily Kandinsky. The latter in particular would have the strongest impact on Bauer's artistic direction into Non-Objective painting. It was during this time that Bauer met Baroness Hilla von Rebay, a charismatic and eccentric young artist who would go on to become The Solomon R. Guggenheim Museum's founding director. She almost single-handedly introduced Non-Objective painting to the American public, and through her influence, Mr. Guggenheim became one of Bauer's greatest supporters, collecting almost three hundred of his canvases. For his part, Bauer became a de facto co-curator for the Guggenheim's collection of modern art. 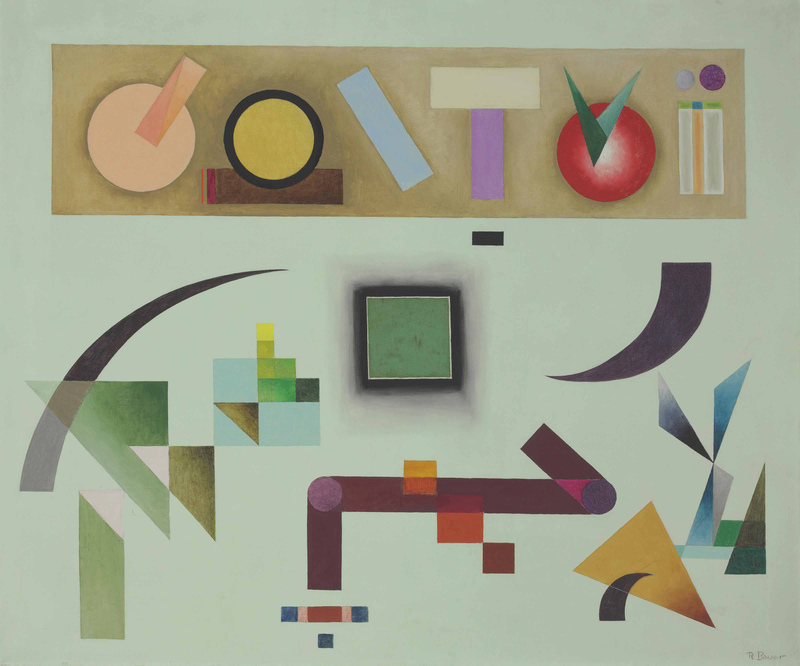 "Vivian Endicott Barnett, in her essay titled 'Rereading the Correspondance: Rebay and Kandinsky,' confirms that it was Bauer, in fact, who was the true architect of Guggenheim's Kandinsky collection" (S. Lowy, Rudolph Bauer, A Non-Objective Point of View, exh. cat., Weinstein Gallery, San Francisco, 2007, p. 13).